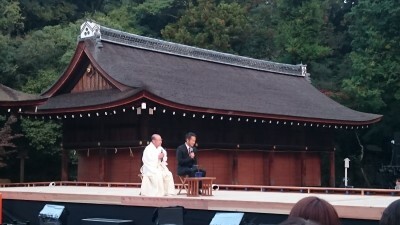 The special talk session by the chief priest of Kamigamo shrine and Amon MIYAMOTO. 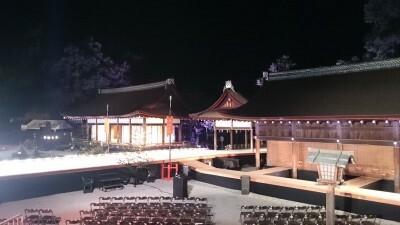 Hosodono which is also used for the wedding ceremony was the main stage of the play. 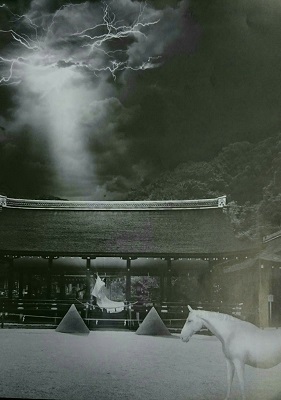 The story of the advent of “Kamo-Sume-Okami”, the enshrined deity was presented in a way easy to understand by the state of the art visual technology and with the narration by Koyuki. At Kamigamo shrine, they have been conducting “Shikinen-Sengu” this year. It is taken place every 21 years. 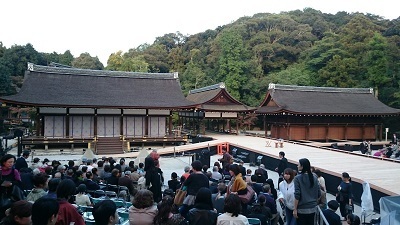 On this very special occasion, a play titled “KOURIN (=advent)” directed by Amon MIYAMOTO was played for the dedication to the shrine. It was a moment that I strongly felt the magnificence of Kamigamo shrine, the oldest shrine in Kyoto. And I realized the importance of the coexistence of human and nature at the same time.